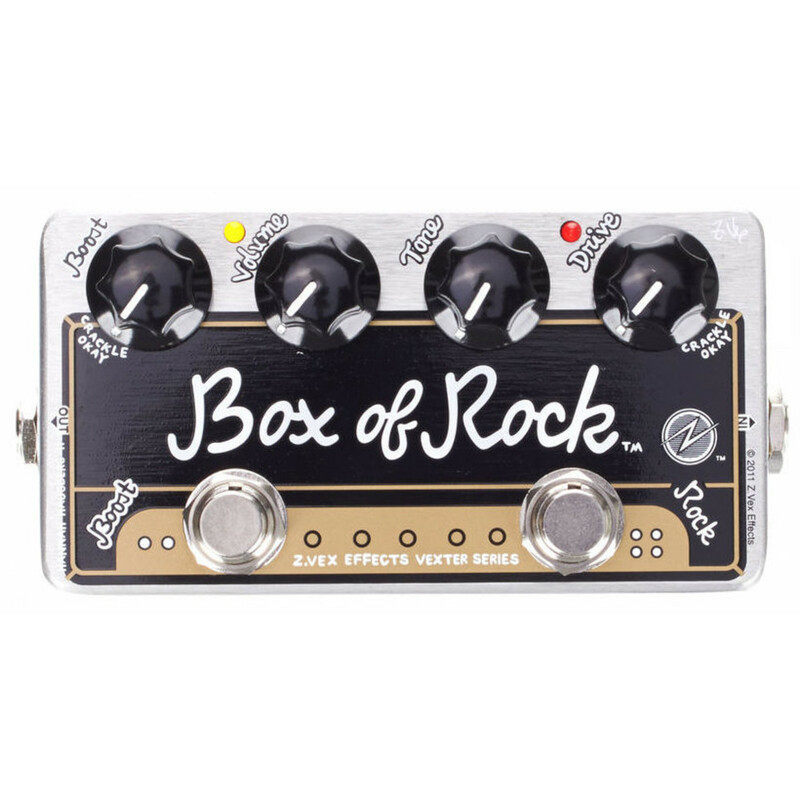 The Box of Rock is Z.Vex Effect's first "distortion" pedal, highly specialized to simulate the "everything on 10" sound of a classic Marshall JTM45 non-master-volume amplifier. You can use the Box of Rock successfully with many different amplifiers. Once you've set your maximum needed drive on the pedal, use your guitar's volume control to adjust for the exact amount of distortion you need, all the way down to very clean and clear with most drive settings. 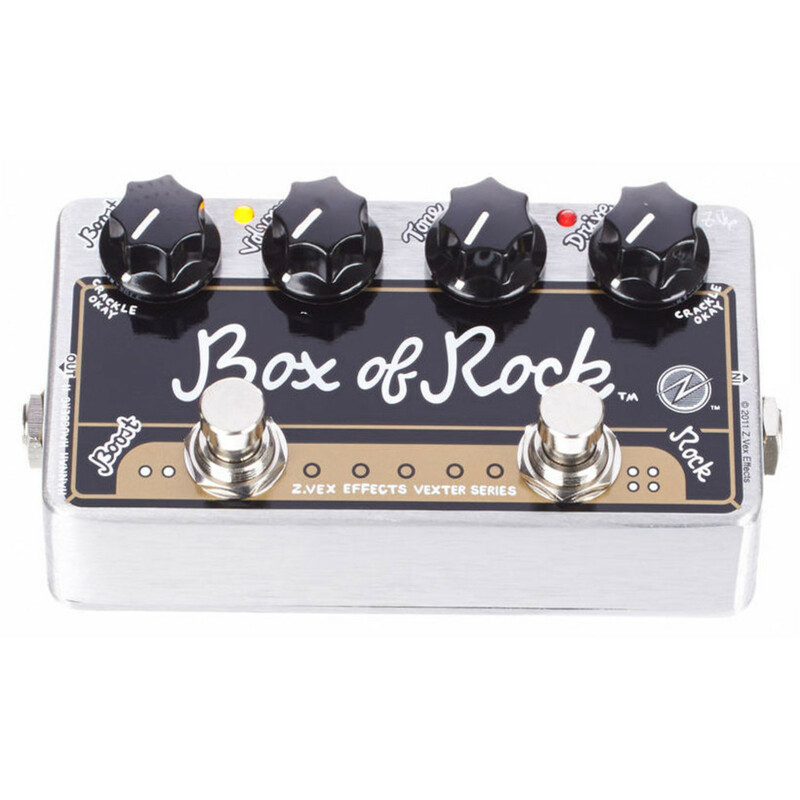 The Box of Rock also contains an extremely high-headroom, unity-to-50X gain booster with nominal input impedance and low hiss. It is very similar to the SHO boost circuit, with refinements to make it sound more like a standard amp input and less glassy. The boost channel can be used alone or in conjunction with the "Distortron engine" channel. 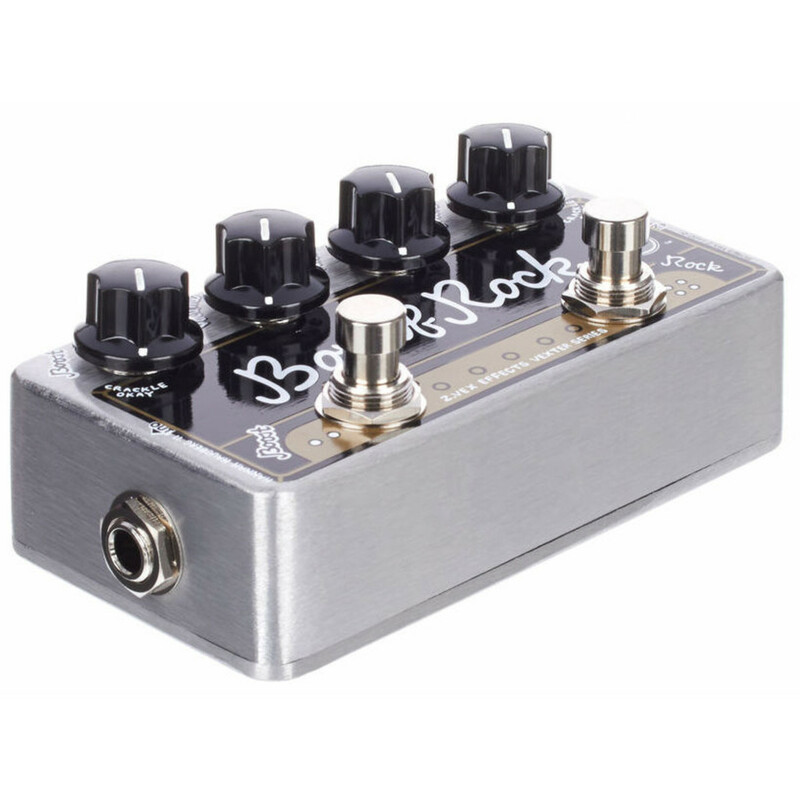 The boost channel follows the distortion channel so that the distortion is able to hit your amp harder (at a higher volume) when both switches are engaged for boosting solos. Look out when boosting! You will notice the words "Distortron engine" on the Vexter version of this pedal. This is what Z.Vex named this distortion circuit. On the hand-painted version, the stomp switch on the right is labelled "ROCK" instead, because their paint brushes are too wide for so many small letters. Otherwise the two pedals are identical. Plug your guitar (or any effect's output) into the right hand input jack. Plug the output into an amp or other effect's input. Rock out. Careful with the Boost setting when using a high-powered amp with lots of headroom... you may be shocked at how loud it can get! If the performance of your pedal seems diminished or the LEDs become very dim, it's time to change your battery. Remove the four screws on the bottom of the pedal and carefully remove and replace the old battery, putting it back exactly in the centre of the pedal on edge so that it is gripped firmly by the lid when it is screwed back in place. Uses a 9V battery. The low current operation of this pedal's circuit will give you a long battery life. Current draw is approximately 3mA. A DC power jack is provided on the side of the pedal. Boost: Sets the boost level, which is engaged with the left stomp switch. Start around the "11:00 o'clock" point. 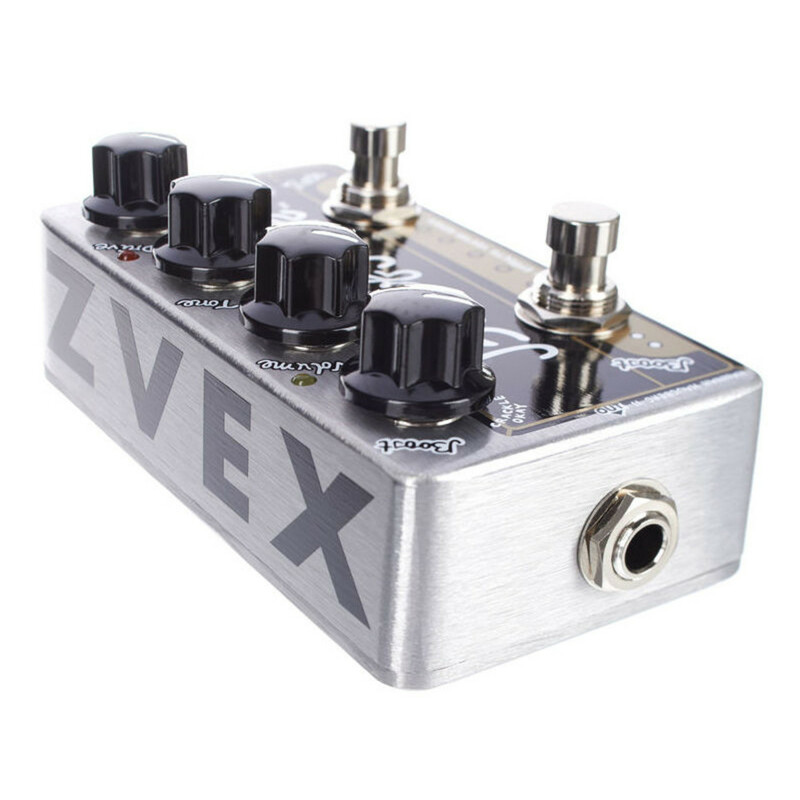 The Drive and Boost controls are based on Z.VEX's original Super Hard-On gain controls, so they can crackle when turned. This is perfectly normal.